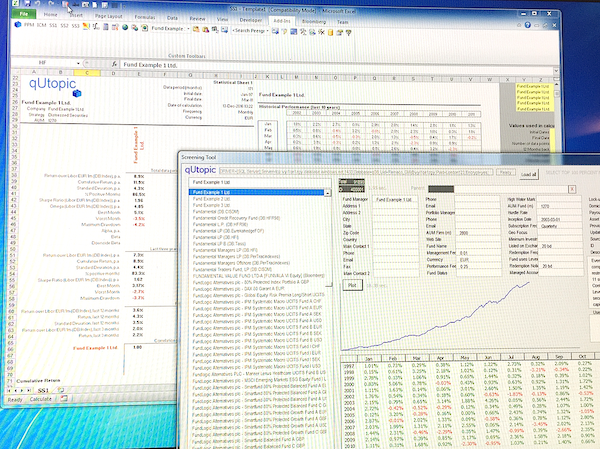 qUtopic for Excel is a fully integrated Excel tool aimed at teams managing portfolios of funds or hedge funds. The tool helps analysts, portfolio managers and risk managers to visualise fund data quickly and effectively. It also helps marketing professionals to produce customised homogeneous top quality fact sheets and simulated portfolios. qUtopic for Excel is easy to install and easy to use. It’s a set of Add-ins that are easy to deploy in stand alone installations or with in corporate networks. qUtopic for Excel is fast because it has been developed in C++. The more than 100 functions in its library are integrated with the rest of native functions and fully documented. Functions return both, singles values and arrays. qUtopic comes with a set of factsheets and other templates that are easy to customise. qUtopic also provides a quantitative ranking for short list analysis.